Have you been scratching your head wondering why your pavers are covered in a whitish cloud all of a sudden? The white substance ruining the appearance of your pavers is called efflorescence. We’ll tell why they’ve turned white and what to do about it. Efflorescence is also known as calcium hydroxide or free lime. The phenomenon of efflorescence occurs when water soluble salts migrate to the surface of the paver with the help of water (i.e., condensation, rain). Once the mixture of water reaches the surface, it mixes with the carbon dioxide in the air and creates a white haze/film that covers the pavers. Unfortunately, the darker your pavers are, the more pronounced the efflorescence. Time is the best cure for efflorescence. Over time, the white haze over your pavers will disappear as a result of capillary blocking (pores blocked by calcium carbonate), abrasion (walking or driving), or weathering (rain or wind). If you want to get rid of it faster than nature allows, try gentle methods first. You can try cleaning the pavers with a mixture of water and mild detergent. Another option is to hire a power washing company to do a low-pressure wash. Other more aggressive options include sandblasting and a chemical cleaning. We always recommend you hire a professional to ensure you do not damage your pavers. Efflorescence occurs naturally and doesn’t damage your pavers, it just gives it an unsightly appearance. 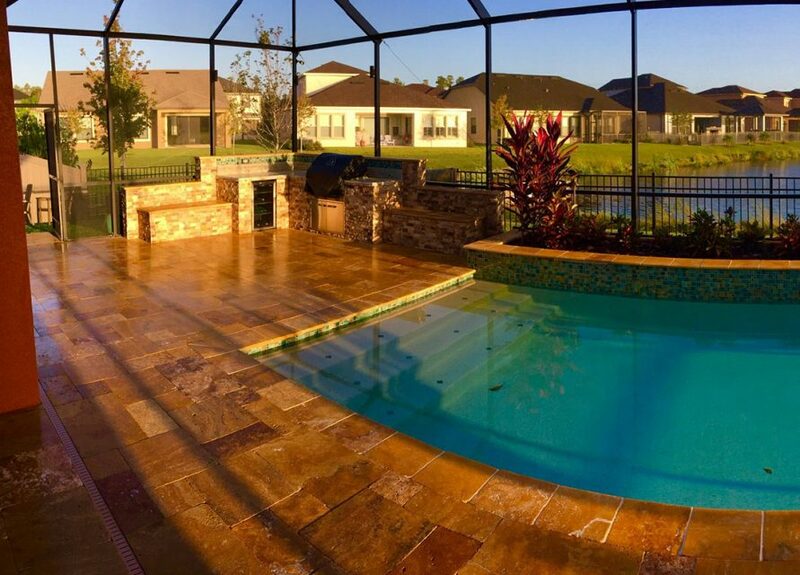 Again, it could disappear on its own over time, but if you want your pavers to maintain their brightly colored appearance, your best solution is to contact Pressure Points for paver sealing in Land O Lakes, FL. The application of a sealer will keep water from penetrating the pavers. It’s best to have the sealing applied when the pavers are clean and dry.